When head chef April Bloomfield came back to London last year, twitter went crazy. She showcased her burger in St. John for 2 days, and I missed out. 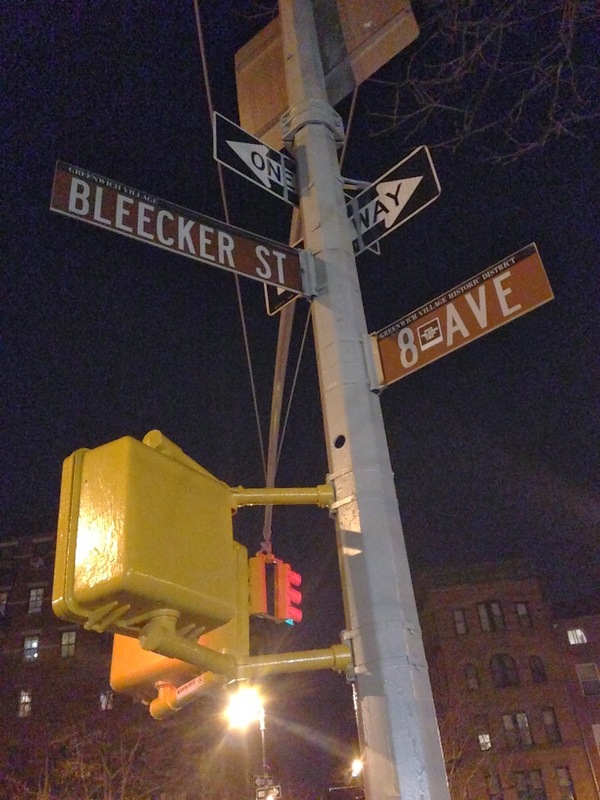 We turned up at around 7:30, for what I regarded as early for a New York dinner on Saturday night. If guessed a wait of close to an hour. Much to the joy of the rest of my party, it was two. Without wanting to be an arse, I put my cards on the table and said I'd like to wait in a pub around the corner. Get a small bite to eat and then head to one of the highest regarded restaurants in the city. Thanks guys. So was this worth the wait? On the whole, no. 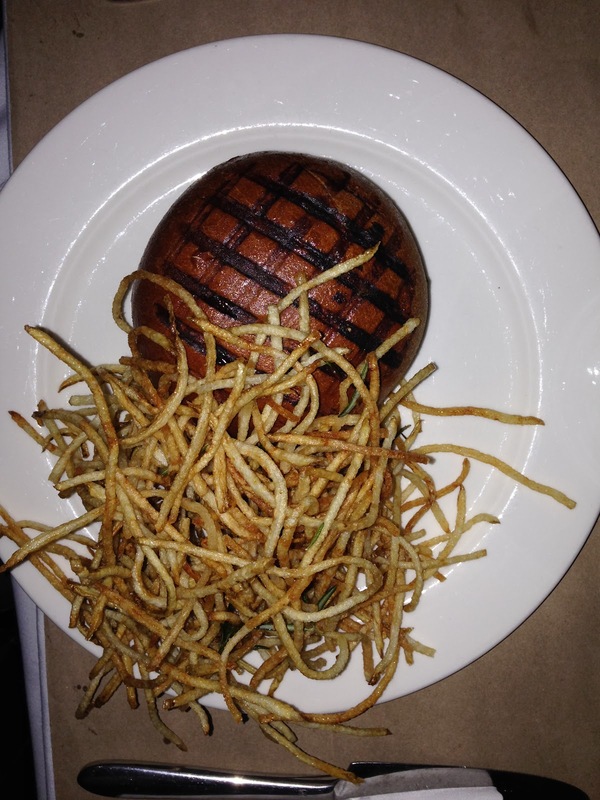 The plate arrives with the iconic grill marks on the bun and a mountain of shoestring fries. The bun has a stronger crust then I've ever seen on a bun. It was class though. Under the few millimetres of crunchy crust lies a soft, well balanced bun that offers a texture that pairs with the beef well. 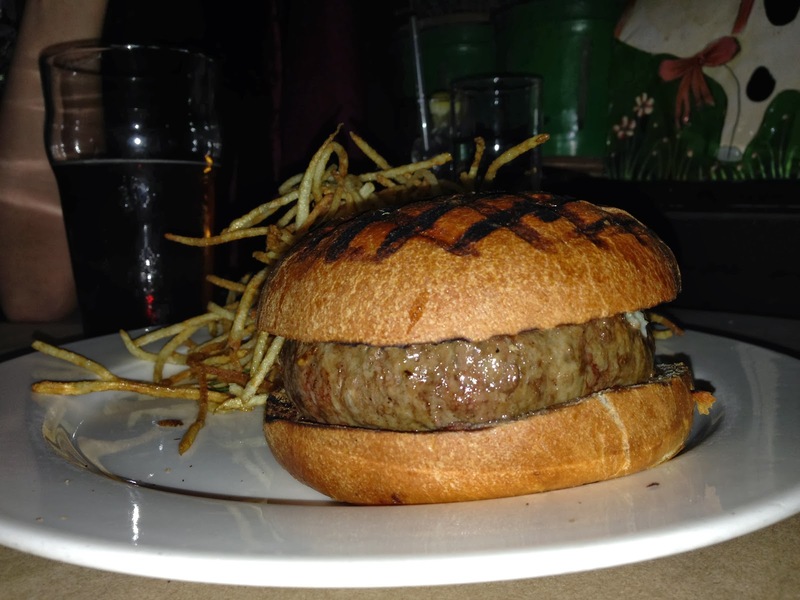 The beef, when picked away from the burger was excellent. Hard to find anywhere for this to improve really. It was a well aged blend, it appeared to have had the lightest mince and although cooked to rare rather then the medium rare ordered - I loved it. Problem was, without picking it away from the burger, I may never have tasted it. The burger is only bun, beef and cheese and I've broken down two elements and not been able to find any fault. "Smell my cheese you mother." Blue cheese over kill. 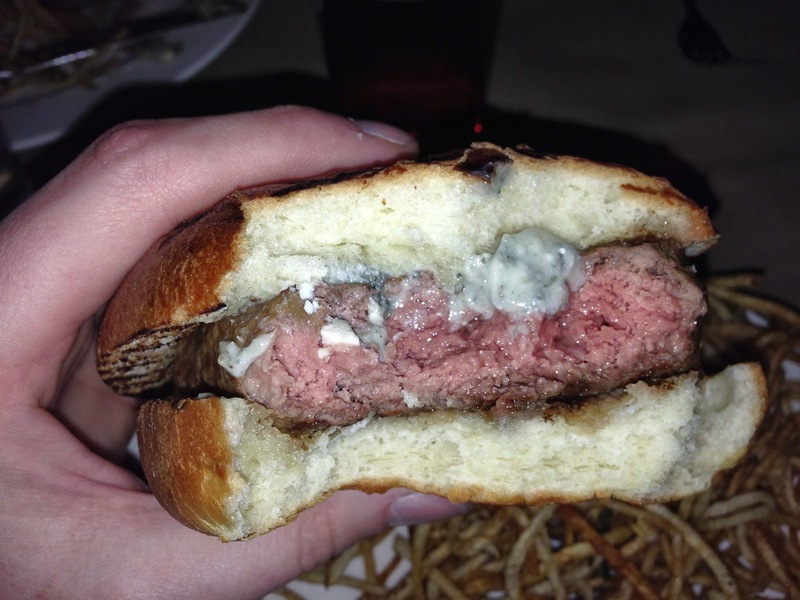 Blue cheese would never be my first pick on a burger, but I've still enjoyed a few in my time. You have to be careful with just a strong flavoured cheese and this was oozing out. The mrs scrapped hers off and was still left with a bite that was too cheesy, too salty for her. I found it hard to argue with her. She was right. Such a shame for this burger to have been destroyed by a topping and 'too much' is purely subjective, so if you like your burger bite to be 90% blue cheese, this is the burger for you. I'd order this without cheese if I ever returned. With the food disappointing after a two hour wait, it felt like a lonely walk back to the apartment that night. I break down my score out of 10 with a heavier weighting on patty and then bun which is why this still scores high.